Looking at the flow Bottom up. DataNode reports to both Active NameNode and Standby NameNode. NameNode's state info will not stored in NameNode itself. It will be stored in a cluster of JournalNodes. When Active NameNode fails, Standby NameNode will automatically grab info from JournalNode, and continue the jobs. When Active NameNode manually proceed to update, we can send command to switch between Active and Standby NameNode. 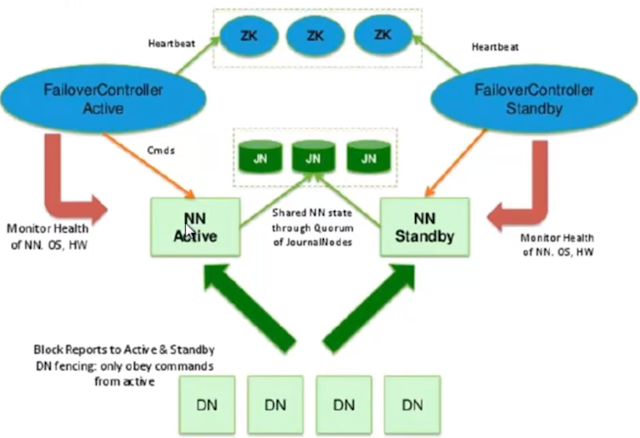 FailoverControllers report heartbeats to ZooKeeper. ZooKeeper is used for HA. Client send request to ZooKeeper, ZooKeeper tells Client which NameNode to work with you. Then Client talks to NameNode. WHen NameNode fails, ZKFC(ZooKeeperFailverController) tries to acquire lock for NameNode. Federation is used for super big amount data, so we need multiple NameNodes, each NameNode is independent, but sharing all DataNodes. Independent means completely independent of NameNode, so if we want to do HA for NameNodes, each NameNode need to configure its own HA. use namenode/namespace to separate data storage and management into different nodes. This make namenode/namespace can expand by simply adding machines. Can separate load of one namenode to multiple nodes. This will not reduce efficiency when HDFS data is big. We can use multiple namespace to separate different types of application. Allocate different data storage/management into different namenode based on application type. 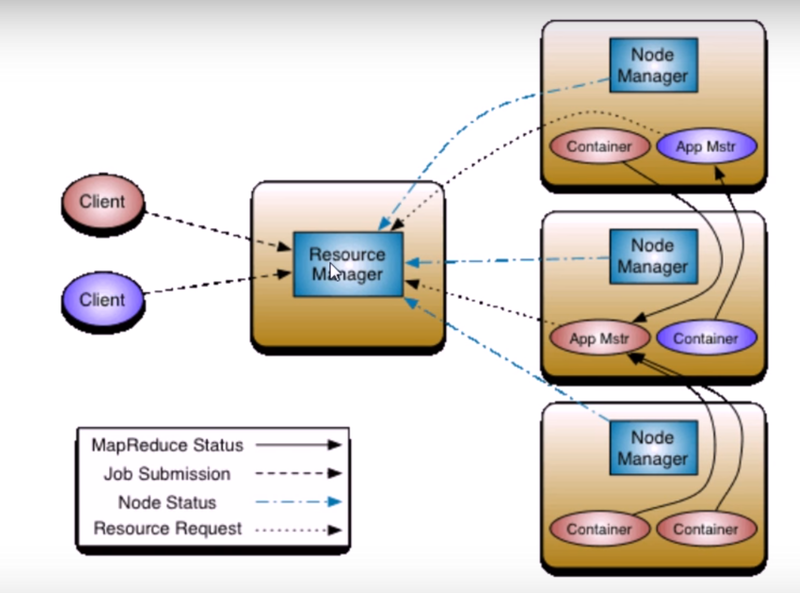 Hadoop 2.0 imported ResourceManager and ApplicationMaster. Separate JobTracker's Resource Management and Task Dispatch from MRv1. It accomplished a lot framework to be interfaced. Multiple frameworks can work same time on YARN: MapReduce, Spark, Storm, etc..
We will not sure which NameNode will be Active, it depends on which NameNode acquired the lock first. The result folder contains an empty file named _SUCCESS which marks the job is succeed. We assigned 5 maps, each map with 20 samples. Each Map has a Container. But the running MapReduce has 6 containers. The one addition container is ApplicationMaster. Provides MapReduce's working logs, for example: Number of Maps, Number of Reduce, job submit time, job start time, job finish time, etc.. It's pointing to port 19888, but port 19888 is not opened by default. using netstat -tnlp to see the port it's really not opened. HDFS files are stored as blocks in hard drive. These blocks were put into a physical pool to be managed. Cluster ID and Block Pool ID are concepts for Namenode Federation. SecondaryNameNode combines fsimage and edits periodically, and update fsimage, delete edits. We can have all of them as virtual machines, start from the first one, then clone hadoop-yarn to other nodes. We will start with building a pseudo distributed first, start with only hadoop-yarn.gvace.com(I will use VirtualBox), which runs everything by it self. After everything tests ok in pseudo distributed, we move on to real distributed(I will use VirtualBox to build all servers). This may not necessary, but let's put it here first. For distributed hadoop, it's all related to ssh communication. So the Namenode server required to talk to any of the Datanode server. One first step is to call "start-dfs.sh", and this script is using ssh to communicate with other servers. We need to enable SSH without password from Namenode server to any slave. For pseudo hadoop server, it also required to ssh to itself if we use "start-dfs.sh" like scripts. So we can try start-dfs.sh first, let's see what server/ip/hostname it requesting to have ssh login. We know 0.0.0.0 means localhost, but when we are in distributed hadoop, which is normally we will do, there will be a lot different datanodes with different hostname/ip. So all these required to have remote ssh without password. In real world, when starting start-dfs.sh and start-yarn.sh, we may have more times to enter password. So remember these host names that requiring password, and then copy public key to those hosts. This will make sure your hadoop system runs without manually typing password. If install succeed, we can try command java and javac to verify. This is too long. 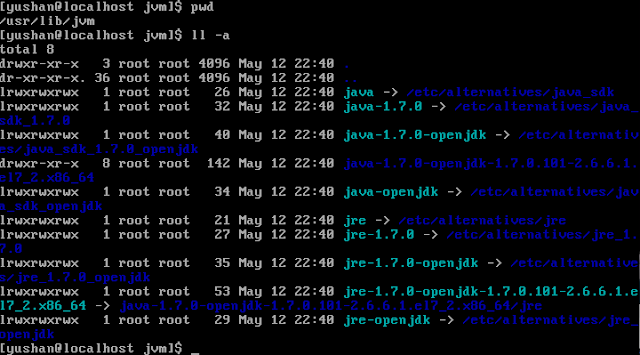 Luckily we have also several links which are much shorter in /usr/lib/jvm. We can find default xml files in source code for core/hdfs/yarn/mapred. So we can pick up the things we need to change from the default xml files, and put them into our xml files. I just found that fs.default.name is Deprecated in hadoop2. We can use fs.defaultFS instead. Rule: replication number must NOT bigger than datanode number. We may find some issue by user permissions. As wee see, by default, hadoop user is the creating user's username, and group is "supergroup"
We can change the whole folder /usr/lib/hadoop-2.6.4 and all its sub forlder/files to the username and group,(create the group name if not exist) and assign 755 on the whole folder. This will be fixed. When namenode starts, it loads fsimage into memory, and run operations from edits. In this moment, Namenode collects reports from datanodes. When data block reached smallest replication number line, it can be seen as "Safe". When a portion(configurable) of data blocks are "Safe", it waits for a moment, then exit Safe Mode. When detect replication number of data block is lower than smallest line, that datablock will be duplicating until it reached smallest line. Datablock's position is not determined by Namenode, it is stored in datanode as block list. If use start-dfs.sh and start-yarn.sh, they require ssh in slave sub scripts, so it can start all services from remote. 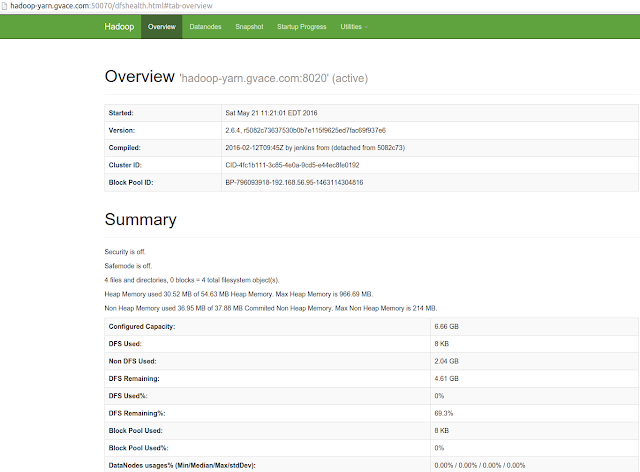 After ssh to remote server, it uses hadoop-daemon.sh to start each individual services. Before we clone the machine, we need to do some config changes for the Namenode. As we know, safe mode is related to dfs.replication, so the number of dfs.replication required to be lower/equal to the number of slaves we have. In this case, we have 3 slaves, so 3 replication is just about good. 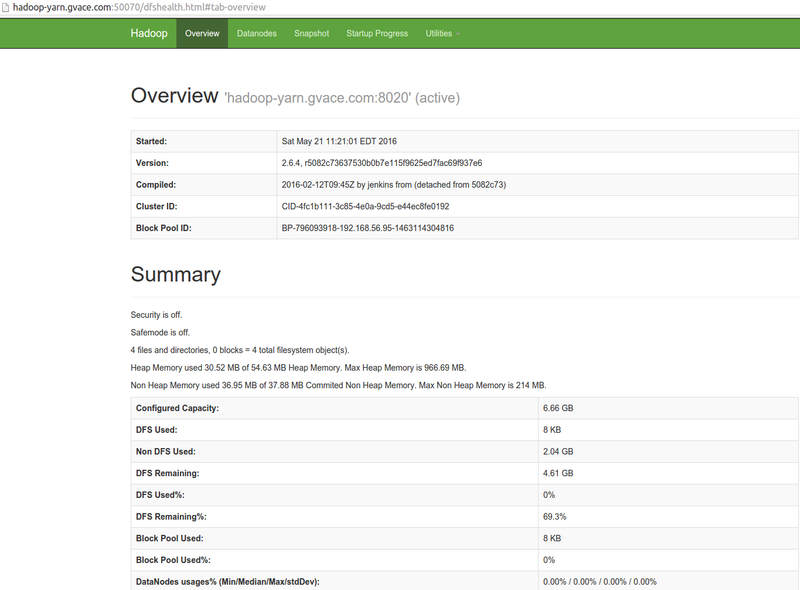 We also move SecondaryNameNode from hadoop-yarn server to hadoop-node1, normally NameNode and SecondaryNameNode are not in the save server. 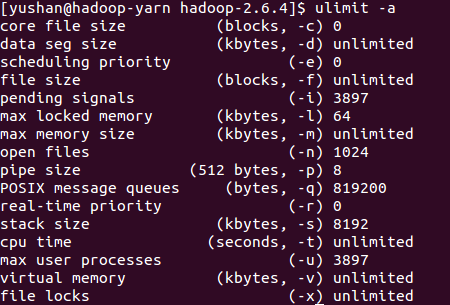 yarn will still run in Namenode, I just replace default value of 0.0.0.0 to real hostname hadoop-yarn. Up to here, we can shutdown Namenode and start clone if you also using VM for all the nodes. The goal is: Use start-dfs.sh and start-yarn.sh from Namenode without password, this require Namenode can ssh to all other nodes without password. To do this, make sure all slaves hosts has ~/.ssh/authorized_keys of Namenode's public key. After all nodes configured, we will do start-dfs.sh from Namenode manually once, from command line. All we want to make sure is: ssh can go through from Namenode to every other nodes without password. This is the final result when we try start-dfs.sh. This is the final result when we try start-yarn.sh. 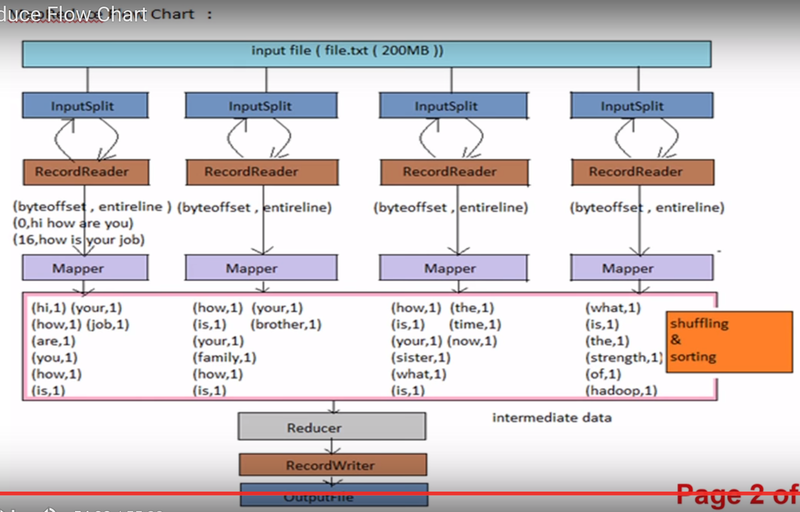 Is an interface which reads file and convert each record to mapper. In the whole procedure, the data result is Key-Value based. And we do all things on the Key, not Value. So we do partition for key, sort for key, merge for key. Not for value. Separate data to different parts, and put result into Memory Buffer. Partition can have customization, default is Hash-Mod, is for data-load-balance(but Hash-Mod may cause data-load-unbalance, so we may need to do customization to make it data-load-balance). Based on this partition, it will later determine which part to go to which Reduce machine. Before results in Memory Buffer exceeds the limit(default 100MB), we have to write data into disk as one file, so we can keep parsing more data. This is called spill. So the sorted and partitioned data will be spill to disk. So this is just a buffer consideration, like use disk as an extension of memory. Spill is accomplished by single thread, it does not affect the procedure of partition(writing data into Memory Buffer). When spill thread started, we need to sort these 80MB(0.8 * 100MB) keys. Sort can have customization, we can determine how to compare and sort the data, default is compared by ascii value(dictionary order). Combiner may not existed, since some map results will never merge together. So combiner is not required. Merge on disk(Combiner) can have customization, default rule is Hash Value. Once the memory buffer is spilled, and the buffer is cleared; when we parsing new data, we have no clue of previous partition status. And the spilled data is already a file in hdfs, that we cannot change that file. To bring all spilled results into one file, we have to re-parse all spilled files, and merge them on to disk(Combiner). So in this procedure, the data will be merged together by the combine rule. put all spilled results from one map task into one single file. This is NOT customizable. This reduce task receives(copy) different pieces of results from multiple maps. And put them in Memory Buffer. Merge the received data with the same key. This may also exceed the Memory Buffer limit size. So it will also spill results as a file on to hdfs each time when reaching Memory Buffer limit. Then merge again for all spilled data(and also data from Memory Buffer). All merged data will be passed to reduce, by sequence, one-by-one, not parallel, not the same time. Before MapReduce Job done, there will be an empty file _TEMP as a flag. If a block is too big, we need to split it to small pieces, then each piece will be processed as a single Map Task. If a block is too small, it will have only one piece and only one Map Task. 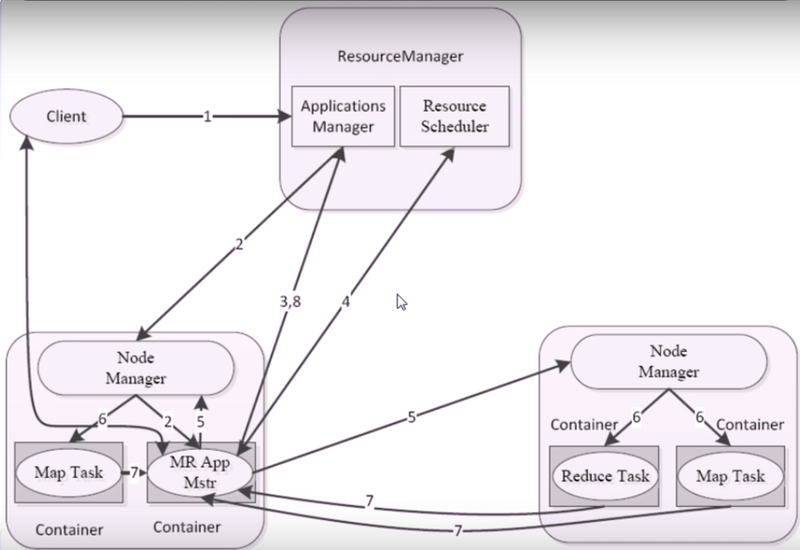 Container: (in NodeManager)a unit of Resource(Memory, disk size, cpu, network io, disk io), there will be a job task in each Container. Some task in Container also will send Task Status to App Master. 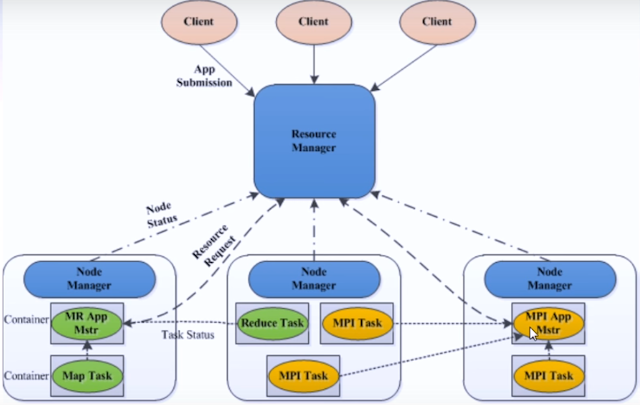 App Master: (in NodeManager)Manager(monitor, manage) for one app. Calculate how much Container it needs, then request the Container from Resource Manager. Once get Container, run the app. Example: MapReduce App Master, MPI App Master, etc..
scripts include hdfs, yarn etc..
hadoop config shell scripts, configs log, environment arguments etc..
Looks like Maven required more specific argument to run, so add an argument into the environment. * The first table is stored on disk and is very precious. * 'NameNode' refers to both this class as well as the 'NameNode server'. * plus some configuration management. * should instead use the org.apache.nutch.hadoop.fs.FileSystem class. * DataNodes in a DFS deployment. * state, for example partial blocksMap etc. Everything we need to use is just FileSystem, which is Implements by DistributedFileSystem. The whole communication between NameNode and DataNode is through RPC, so all functions for user is looks like everything runs locally. But it actually done by Proxy. * It's used to upload current load information and block reports. * returning values from these functions. * alive and well. Includes some status info, too. * an array of "DatanodeCommand" objects. DataNode sendHeartBeat() to NameNode, NameNode returns DatanodeCommand so DataNode can do job by following the returning command.